You see, the problem is this: You’re creating a bunch of content that’s pretty much crap in an effort to lure people to your site (or whatever destination you have). It’s turning into a massive bait and switch type mentality where you’re missing the point of content marketing, and of publishing in general. That’s not content marketing. That’s offering a free sample. And you’re getting the two confused. Great content marketing is as simple as this: providing great content and as a side result, building brand awareness and loyalty. It seems nowadays that every time I go to a site I’m prompted to buy something. Or, at the very least, sign up for something that puts me into a conversion funnel where I’m treated as a potential sales lead. Tech companies (in particular a lot of SaaS companies) are notorious for this. Drive you in with a promise of great content, but lock it behind a “sign up to download” form … and then they call you or email you soon thereafter asking you to buy their product. I get it. It’s marketing and sales. But you’re starting to ruin things for everyone. The whole point of why content marketing works (or worked) was because it was offering something of value to people that could drive them in. As customers keep getting bombarded with sales pitches and promotions, they’re going to stop trusting all of this and start going back to the places they can trust. Look at it like the current issue with fake news sites. They’re using “content” to drive people to their platform, and monetizing it along the way – but it can only work for so long until people get fed up with it. Then they will go back to the reputable sites and start ignoring everyone else. The funny thing is, you can be one of those reputable sites. If your goal is to have a content marketing strategy, you first have to build a content strategy. You need to be offering up high quality content on a regular basis and stop with all the asks! Gary Vaynerchuk has this pretty much right with his concept of jab, jab, jab, right hook. All too often we’re only getting right hooks and it’s just creating a big mess of nastiness out there. It’s creating a cesspool of content online. Pure and utter trash that’s there for no reason other than to try to drive a sale, rather than to provide value. 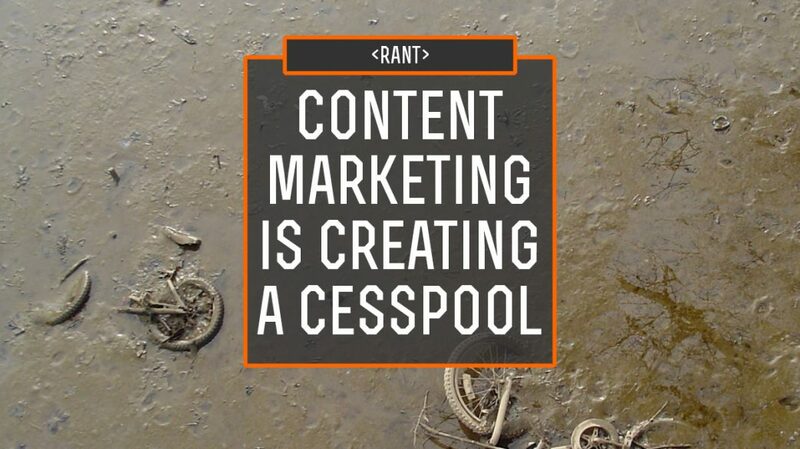 As that cesspool grows, people are going to start learning to avoid it. And you know who that hurts? People like you and me. My site is basically here to share thoughts, tips and news. I’m not asking you for anything (although you will get prompted to sign up for my emails, as they’re a great way to get updates from me without having to come back to the site every day). Yes, I have underlying reasons for offering this content. I’m not only writing this out of the goodness of my heart. To be honest, I hope that my content does a few things: 1.) help people become better marketers, 2.) help marketing continue to evolve, and 3.) show I know what I’m talking about in case anyone ever wants to pay me to speak, guest blog or do consulting work for them. Is this something I think my readers might find interesting? Do I have something valuable to say on the subject? If the answer to both of those is “yes” then I create the content. And so far you know what? I think most of what I offer is valuable. I’m proud of what I have here. Is Your Content Trash or Treasure? Are you proud of your content? If there was no financial gain in it for you, would you still consider it valuable? Think about that the next time you’re about to post something. If the answer to those questions is no, delete your draft and start over.